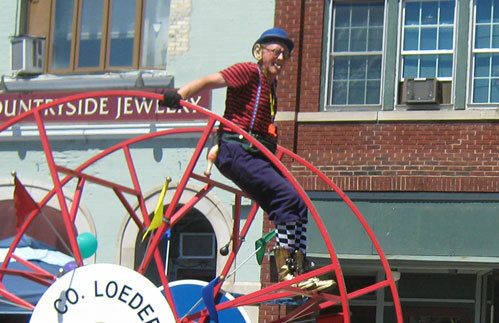 Melvin has been rolling around in one city or another for the past 15 years, rotating hundreds of miles in over 700 parades. His single-minded focus in all of his roving around is to spread joy and whimsy wherever he shall go in his 10 foot tall super loop of destiny. 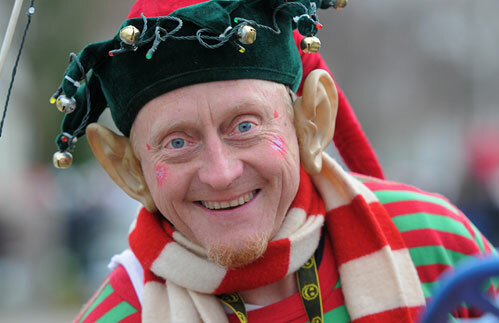 He has made appearances at the Minnesota, Iowa, Indiana, Oklahoma, Kentucky, North Carolina, and Wisconsin State fairs, as well as performing at The Indy 500 Parade, The Buckhannon Strawberry Festival Parade in West Virgina, and the National Cherry Blossom Parade in Washington D.C.
Melvin Hails from Madison Wisconsin. Performed in over 700+ parades since 1999. The wheel itself is 4’ wide, 10’ tall and weighs 300 #’s. It is equipped with 12 horns, 8 bells and 2 water bottles (just in case). Melvin is 6’2”, 185 #’s, 54yrs. Old. 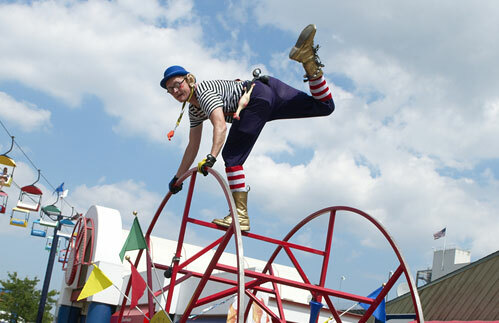 Before he was the Wacky Wheeler he performed as a skateboarder, trapeze artist, stiltwalker and pogo stick expert.